We last looked at The Conduit's game-play data back on September 24. The Conduit was developed by High-Voltage Software(HVS), and published by Sega. If you didn't know, it was announced earlier this year that HVS is working on a sequel for The Conduit, Conduit 2 . HVS and Sega have been releasing more screens, trailers, and information on Conduit 2 since the last report I did on The Conduit; and here's a trailer showing off some quick game-play footage from Conduit 2. With 525 days of reported play-time data, how many hours have Wii owners spent playing The Conduit and helping rid Washington D.C. of its alien invasion? Let's take a look! 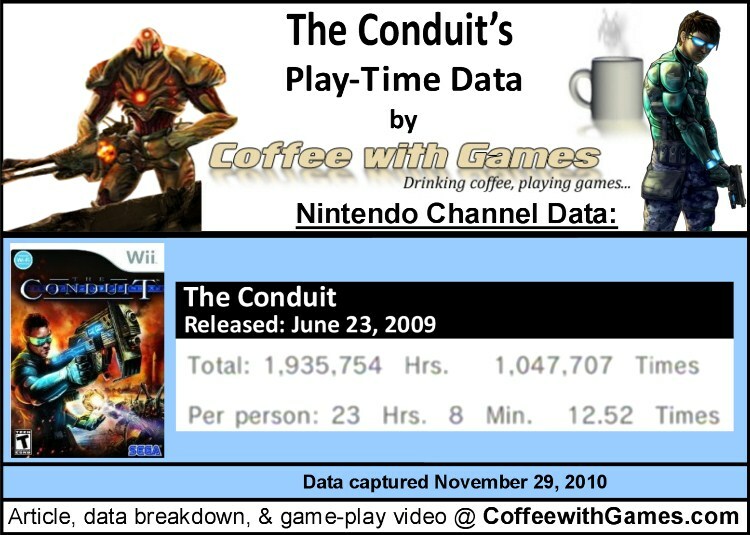 The Conduit now has 83,682 Wii owners reporting their game-play data, through the Wii's Nintendo Channel. 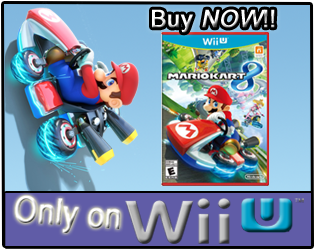 The Conduit has seen an increase of about 5,133 Wii owners reporting game-play data, since the September 24 report. The Conduit has 1,935,754 Total Hours of game-play reported, an increase of 133,641 reported game-play hours since September 20. 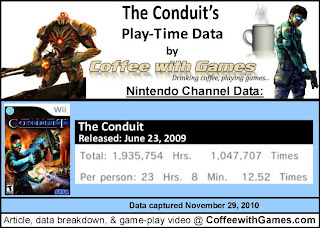 The Conduit's average play-time "Per person" is 23 Hours 8 Minutes; and its average play-time per session is just over 1 Hour 50 Minutes. In the report I posted back on September 24, I stated, "Amazon.com has been out-of-stock of The Conduit, basically every day I have checked, since July." The situation is still the same with The Conduit not being sold "new" directly from Amazon.com, but some orders for the game are being "fulfilled by Amazon.com" for third party vendors; with that in mind, here is the Amazon.com sales information currently for The Conduit. The Conduit's Amazon.com sale rank is #2,653, and is currently selling for $33.28 from an Amazon.com third party vendor. The Conduit's review score average is 72.37%, based on 64 "professional" reviews on GameRankings.com. Its review score is the same as it was in September. The Conduit was a game I was really excited for, and I purchased it the day it released. I became annoyed with the game's online play, mainly due to the glitches, and soon the lack of people playing on my friends' list; so I traded it off in October 2009. Well, fast-forward to October 2010, and I ended up getting The Conduit back. I hopped online and was able to play a few matches without any problems. Then, one night, I played a fellow reader of the site, GoNintendo.com, and I had a major issue with the game's online multi-player. Destruction aside, I think The Conduit's reported game-play hours are really good for a third party Wii game; though I think they would be a lot higher than they are now, if the game didn't have the online glitches/hackers that ruined the online experience for many. I think HVS probably learned from some of the mistakes that slipped through in The Conduit, and I'm hopeful Conduit 2 will be a great FPS experience Wii owners can experience when it's released in February 2011. If you own The Conduit, do you find yourself still playing it often? If you do/don't own the original, are any of you planning on purchasing Conduit 2 when it releases in February? Yea, I played the game more than 150 hours before I traded it off...at least that's what was shown. I was also a big defender of the game against junk reviews like GamePro's...which I didn't necessarily disagree with the overall score, but the actual context of the review was horrible. I'm not the kind of person that keeps grabbing the next biggest shooter, cause I just don't need that kind of experience that often. If the community is there for it, I could stay with one shooter through several other big releases, whenever I get the craving. I haven't played The Conduit very recently; it's been maybe 5 months.....but it was actually still quite full of hackers and/or people taking advantage of glitches. While I know any claims High Voltage makes to fight hackers with Conduit 2 will just make the hackers try harder, I'm glad they're attempting to set up a system to fight it/them. I don't really play the Conduit anymore.Last time I did was for a tourney a month back over at NinTemple.com. Didn't do so well but it is an enjoyable game. All the glitches and hacker problem I've found really doesn't happen when you play with friends. I do plan on picking up Conduit 2. After I played the main game and the online I traded it in. The game played well offline, but the overall gameplay and story was lacking. Hopefully 2 rectifies that. Online Multiplayer I just couldn't get past how slow you ran in the environments. But Im very interested in the sequel, and now that I know that even new shooters also suffer from hackers, I might play private matches and invasion mode more often. "If the community is there for it, I could stay with one shooter through several other big releases, whenever I get the craving." This is a big problem for most games today. It seems most gamers that enjoy the FPS genre, move from one to the next, really quickly. Every 2-6 months there seems to be another "EPIC FPS" released, that is trying to get the attention of gamers out there. As for the hackers issue, I think it's a Wii problem in general...though the Call of Duty Wii games haven't had many issues in that area, so hopefully HVS has taken a look at those games and applied the same code/online system they have. I'm not sure if the glitches can happen in private matches, as I've only played a few private matches with the game; the spawn glitch is the worst one of them all, IMO. 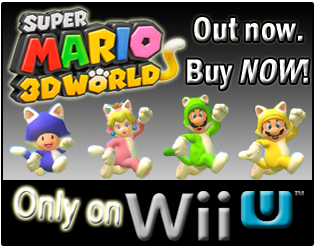 "The game played well offline, but the overall gameplay and story was lacking. Hopefully 2 rectifies that." I liked the storyline that was there, because there was/is a bit of mystery behind it. I liked the use of the ASE to find the hidden messages on the walls, and the random radio messages you could listen to around the different levels. "Online Multiplayer I just couldn't get past how slow you ran in the environments." I'm not sure, but I thought I read they are adding a sprint function in Conduit 2...perhaps I'm thinking of another game. If Invasion Mode is done well, like Zombie Mode in Black Ops, it could add a lot of replay value to the game. Tcon is an awesome game and it still is . When u get good at it it just blows away the hackers / glitchers u c in pubs knowing u have the skill to pwn no matter wat xD but yeah c2 is when we make our comebak ....by Any chance do any uv u know the old pros uv tcon ??? Well, you say the community moves on, but I think it's just the people you've made friends with that might move on. And in that situation I'd just make new Conduit friends. Heck, I was still able to quickly enjoy Medal of Honor Heroes 2 online games months after The Conduit came out. So, I think the communities are much more loyal than you think. Thanks for the information, I thought I had read it somewhere! The biggest glitch I had a problem with was the spawn glitch, the hackers and other glitchers were sometimes annoying...but nothing like the spawn glitch. Also, I didn't really understand the last part of your phrase if it was a question...can you ask it again if it was a question? No, I usually play FPS games just with random matches...I rarely would get into Call of Duty: World at War or The Conduit specifically to play matches against other people I knew. The Conduit started taking several minutes to find matches, in late September and early October 2009...on top of that, few to none would show up on my friends list...so I would just have to wait. I realized the online game was probably slowing down, because of the spawn glitch, then the hackers causing issues...so I traded it off before the price dropped...to try to lose less. I never did play Medal of Honor Heroes 2, but I heard a lot of good about it. I was really close to buying it several times, but held off and purchased World at War when it released. Thanks for the comments and replies!